U.S. Settles Claims Against BP Over Deepwater Horizon Spill For $20 Billion : The Two-Way Attorney General Loretta E. Lynch calls the deal "the largest settlement with a single entity in American history." The Deepwater Horizon oil rig explosion on April 20, 2010, killed 11 people and resulted in the nation's largest offshore oil spill. Federal and state claims against BP for the April 2010 Deepwater Horizon oil spill have been resolved, the Justice Department says, with the oil and gas company agreeing to pay more than $20 billion in penalties. Calling it "a historic resolution," U.S. Attorney General Loretta E. Lynch said Monday that the deal is "the largest settlement with a single entity in American history," with a record environmental penalty. The deal was first announced in July. "The Deepwater Horizon accident killed 11 workers and led to a massive oil spill in the Gulf of Mexico. This settlement money will pay for additional clean-up and restoring the land, water and wildlife harmed," NPR's Jeff Brady reports. "The federal government is settling for less than it might have collected in court. But [Lynch] says this agreement ensures money will get to Gulf Coast communities that need it sooner." According to BP, the settlement announced today "does not reflect a new settlement or any new money." Instead, the company says, the figure touted by U.S. officials today includes money that was previously spent or announced. Details of the resolution were announced Monday by Attorney General Lynch at a news conference that also included Commerce Secretary Penny Pritzker, Secretary of Agriculture Tom Vilsack, and EPA Administrator Gina McCarthy. We've updated this post to reflect the deal's details. After listing the wide effects of the spill — such as the 3 million gallons of oil that was released and the more than 1,300 miles of coastline in the Gulf that was stained — Lynch said the penalty "should inspire BP and its peers to take every measure necessary to ensure that nothing like this can ever happen again." 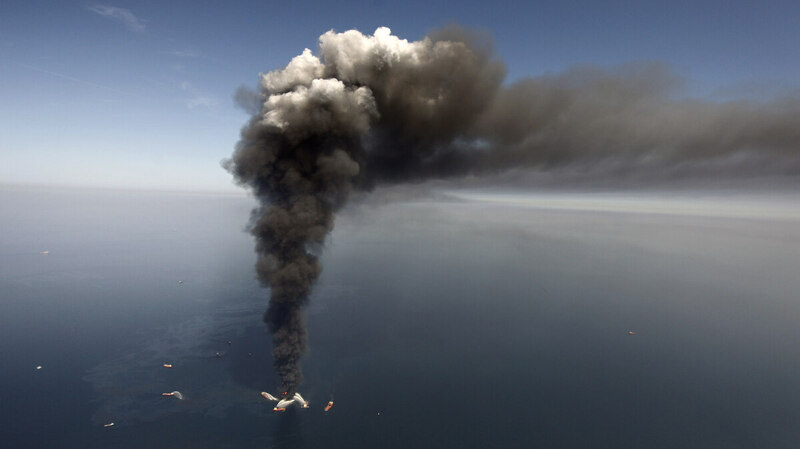 Reacting to news of the deal, National Wildlife Federation President and CEO Collin O'Mara said it "shines greater light on the Deepwater Horizon's impacts on wildlife and their habitats." He added that the penalties should go toward ecological projects in the Gulf. With today's announcement, the government is opening two months of public comment on the settlement. It'll then go before a federal judge for final approval.